While in our care, Precision Prefinishing provides proper storage and safe handling of customer wood products. 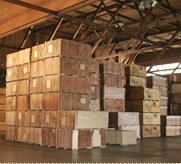 Our facility has over 130,000 square feet of warehouse space located in the heart of Oregon wood country. Flatbed trucks are loaded in a spacious covered loading area, ensuring your product is protected from the weather. We have the ability to unload and load vans, pig vans and overseas containers. We can barcode, store, repackage and reload your product. If you demand a warehouse facility that will carefully handle your product, and provides you with accurate inventory counts then call us today. We have the knowledge and skill to keep your investment safe.